Israeli forces have continued with systematic attacks against Palestinian civilians and their property in the occupied Palestinian territories (oPt) for the reporting period of 10 - 16 Sep. 2015. Israeli forces continued to use force against Palestinian civilians participating in peaceful protests in the West Bank. In the Gaza Strip,Israeli forces continued to open fire at border areas along the Gaza Strip borderline and to attack and chasePalestinian fishermen in the sea.During the reporting period, Israeli forces wounded 20 Palestinian civilians, including 6 children and 3 women, 2 of whom are journalists, in the West Bank and Gaza Strip. Moreover, 9 journalists sustained bruises as they were directly attacked by Israeli forces. In the West Bank, 19 Palestinian civilians, including 6 children, 3 women and a civil defence officer, were wounded; 11 of whom were wounded in occupied Jerusalem, one in Jenin, another one in Tulkarm and the others were participating in peaceful protests against the settlement activities and annexation wall. On 13 September 2015, 5 Palestinian civilians, including a child, a civil defence officer and 2 journalists, were wounded when Israeli forces stormed al-Aqsa Mosque in the old city in occupied Jerusalem. Moreover, 9 journalists sustained bruises as they were directly attacked by Israeli forces who stormed the mosque. On the same day, a 24-year-old civilian sustained a bullet wound to the left thigh during an Israeli incursion in Jenin city and its refugee camp. On 14 September 2015, a 68-year-old civilian sustained a bullet wound to the eye when Israeli forces stormed al-Aqsa Mosque and fired sound bombs and rubber-coated metal bullets. In addition, a 26-year-old civilian from al-Eisawiya village, northeast of Jerusalem, was wounded, but Israeli forces obliged the ambulance transporting him at gunpoint to head to Hadasa Hospital and then arrested him. On 15 September 2015, a Palestinian woman sustained shrapnel wound in her leg by a sound bomb when Israeli forces raided al-Aqsa Mosque for the third day. Israeli forces also fired sound bombs and threw stones at Palestinian worshipers to secure the settlers' raids in the new Hebrew year. On the same day, a Palestinian civilian was wounded when Israeli forces moved into the vicinity of Palestine Technical University- Khadoorie after a number of Palestinian youngsters gathered near the old liaison office, west of Tulkarm, in protest at storming al-Aqsa Mosque. On 14 September 2015, 3 Palestinian children were wounded in East Jerusalem in 3 separate incidents. A 14-year-ols child was wounded while being present in front of his family house in Ras al-Amoud neighborhood and was then arrested. A 13-year-old girl sustained a bullet wound to the neck during clashes between Palestinian civilians and Israeli forces at the entrance of al-Eisawiya village, north of East Jerusalem. A 17-year-old child from Shu'fat refugee camp, north of Jerusalem, was wounded when Israeli forces chased and fired at him. Israeli forces continued to use excessive and systematic use of force against peaceful protests organized by Palestinian civilians and Israeli and international human rights activists in protest at the construction of the annexation wall and settlement activities in the West Bank and Israeli policies in the oPt. As a result,6 civilians, including 2 children, were wounded. In the Gaza Strip, on 15 September 2015, a Palestinian field regulation officer in the border area was wounded when Israeli forces stationed along the border fence, east of Khan Yunis in the south of the Gaza Strip, opened fire at a jeep of the Field Regulation Service that was on the dirt road lately established 250 meters away from the border fence, east of Abasan. On 13 September 2015, Israeli forces stationed along the border fence, northwest of Beit Lahia in the north of the Gaza Strip, opened fire at the border area, but no casualties were reported. In the context of targeting Palestinian fishermen, on 11September 2015, Israeli gunboats stationed off al-Waha resort, northwest of Beit Lahia in the north of the Gaza Strip, opened fire sporadically around fishing boats. Similar shooting incidents occurred on 12 and 13 September 2015, but neither casualties nor material damage were reported.However, the fishermen were terrified and sailed back to the shore. During the reporting period,Israeli forces conducted at least 47 military incursions into Palestinian communities in the West Bank and8 ones in East Jerusalem.During these incursions, Israeli forces arrested at least 48Palestinians, including 12 children and 3 women. Twenty-six of these civilians, including the 12 children and 3 women, were arrested in East Jerusalem. On 16 September 2015, Israeli forces handed Mohammed Ezzat Makhamra from Kherbet Khellet al-Mayeh, east of Yatta, south of Hebron, a notice to halt construction works in his 2-storey house, under the pretext of non-licensing. On the same day also, Israeli forces handed Mohammed Ra'ed al-Emour from Kherbet Erfa'iya, southeast of Yatta, south of Hebron, a similar notice under the pretext of not licensing the construction of his 1-storey house. In the same context, on 13 September 2015, a number of settlers in a vehicle coming from the western part of Hawwara village, south of Nablus, attempted to kidnap a 7-year-old child, who was walking in the street. A settler tried to pull the boy into the car, but the boy screamed and fell down and sustained bruises in the neck and back. During the reporting period, Israeli soldiers used excessive force against peaceful demonstrations organized by Palestinian civilians, international and Israeli human rights defenders in protest at the construction of the annexation wall and settlement activities in the West Bank and Israeli policies in the Palestinian territory. As a result, 6 Palestinian civilians, including 2 children, were wounded; 4 of them in Kafor Kadoum weekly demonstration, northeast of Qalqilya, while the two children were wounded in Selwad demonstration, northeast of Ramallah. Following the Friday prayer on 11 September 2015, dozens of Palestinian civilians and international and Israeli human rights defenders organized a peaceful demonstration in Bil’in, west of Ramallah, in protest against the annexation wall and settlement activities.The protestors tried to cross the fence. Israeli soldiers stationed behind the wall, fired live bullets, rubber-coated steel bullets, tear gas canisters and sound bombs and chased them into the olive fields and into residential houses in response. As a result, many civilians suffered tear gas inhalation and others sustained bruises as Israeli soldiers beat them up. On the same day, dozens of Palestinian civilians organized a peaceful demonstration in the center of Ni’lin village, west of Ramallah, in protest against the annexation wall and settlement activities. The demonstrators took the streets and headed to the annexation wall. Israeli forces prevented the demonstrators from crossing to the land behind the annexation wall, so they threw stones at them. Israeli soldiers fired live bullets, rubber-coated metal bullets, sound bombs and tear gas canisters at the civilians, and chased them into the village. As a result, many civilians suffered tear gas inhalation and others sustained bruises as Israeli soldiers beat them up. Around the same time, dozens of Palestinian civilians and Israeli and international human rights defenders organized a peaceful demonstration in al-Nabi Saleh village, southwest of Ramallah, in protest against the annexation wall and settlement activities. The demonstrators headed to the lands that the settlers are trying to rob by force near “Halmish” settlement. Israeli forces had closed all the entrances of the village since the morning to prevent them from participating in the demonstration. When they arrived at the aforementioned land, the demonstrators were met by live bullets, tear gas canisters, rubber-coated steel bullets, sound bombs and were chased into the village. As a result, many civilians suffered tear gas inhalation and others sustained bruises as Israeli soldiers beat them up. At approximately 13:30 on Friday, Palestinian civilians and Israeli and international human rights defenders organized a protest in the center of Kufor Qaddoum village, northeast of Qalqilya, heading to the eastern entrance of the village in protest against closing that entrance since the beginning of al-Aqsa Intifada with an iron gate. When they arrived at the entrance of the gate, the demonstrators were met by live bullets, tear gas canisters, rubber-coated steel bullets, sound bombs. As a result, 4 civilians, were wounded. The first one, 24, was hit by a sponge-tipped bullet ; the second one,25, was hit by a bullet to the right leg; the third one, 24, was hit by a bullet to the left leg; while the fourth one, 18, was hit by a bullet to the right leg. At approximately 17:00 on Saturday, 12 September 2015, Palestinian civilians and Israeli and international human rights defenders organized a protest in the center of Kufor Qaddoum village, northeast of Qalqilya, heading to the eastern entrance of the village in protest against closing that entrance since the beginning of al-Aqsa Intifada with an iron gate. When they arrived at the entrance of the gate, the demonstrators were met by live bullets, tear gas canisters, rubber-coated steel bullets, sound bombs. As a result, many civilians suffered tear gas inhalation and others sustained bruises as Israeli soldiers beat them up. On Friday afternoon, 11 September 2015, dozens of youngsters gathered in the southern entrance of Salwad village, northeast of Ramallah, on the road between Selwad and Yabroud, near Street (60) to organize a protest against Israeli policies. The protestors set fire to tires and threw stones at Israeli soldiers who fired live ammunition, rubber-coated metal bullets, sound bombs and tear gas canisters in response. As a result, 2 children were wounded and were taken to Palestinian Medical Complex in Ramallah to receive medical treatment. A 16-year-old child was hit by a ToTo bullet to the left leg, between the ankle and the knee, while a 17-year-old child was hit by a ToTo bullet under the left knee. Israeli forces continuously tighten the closure of the Gaza Strip and close all commercial crossings, making the Karm Abu Salem crossing the sole commercial crossing of the Gaza Strip, although it is not suitable for commercial purposes in terms of its operational capacity and distance from markets. Israeli forces have continued to apply the policy, which is aimed to tighten the closure on all commercial crossings, by imposing total control over the flow of imports and exports. Israel has continued to close the Beit Hanoun (“Erez”) crossing for the majority of Palestinian citizens from the Gaza Strip. Israel only allows the movement of a limited number of groups, with many hours of waiting in the majority of cases. Israel has continued to adopt a policy aimed at reducing the number of Palestinian patients allowed to move via the Beit Hanoun crossing to receive medical treatment in hospitals in Israel or in the West Bank and East Jerusalem. Israel also continued applying the policy of making certain civilian traveling via the crossing interviewed by the Israeli intelligence service to be questioned, blackmailed or arrested..
Hebron: Israeli forces established 11 checkpoints in various areas in the governorate. On Thursday, 10 September 2015, Israeli forces established 2 checkpoints at the northern entrance of Halhoul village, north of Hebron, and at the entrance of Samou' village, south of Hebron. At approximately 07:30 on Friday, 11 September 2015, Israeli forces established a checkpoint at the northern entrance of Athana village, west of Hebron. At approximately 16:00 on Saturday, 12 September 2015, Israeli forces established a checkpoint at the entrance of Beit Awaa village, south of Dura, southwest of Hebron. On Sunday, 13 September 2015, Israeli forces established 2 checkpoints at the entrance of al-'Aroub refugee camp, south of Hebron, and at the entrance of Abdu village, southeast of Dura village, southwest of Hebron. On Monday, 14 September 2015, Israeli forces established 2 checkpoints at the entrance of al-Daheriya village, south of Hebron, and at the northern entrance of Yatta village, south of Hebron. On Tuesday, 15 September 2015, Israeli forces established 2 checkpoints at the northern entrance of Yatta village and at the entrance of al-Koum village, southwest of Dura, southwest of Hebron. At approximately 15:00 on Wednesday, 16 September 2015, Israeli forces established a checkpoint at the southern entrance of Halhoul village, north of Hebron. Qalqilya: Israeli forces established 7 checkpoints in various areas in the city. On Saturday, 12 September 2015, Israeli forces established 3 checkpoints at the entrance of 'zoun village, east of Qalqilya, the second checkpoint between Jayous and Kafor Jamal villages, northeast of the city, and the third checkpoint were established at the eastern entrance of Qalqilya. On 14 September 2015, Israeli forces established 3 checkpoints at the entrance of Hejaa village, at the entrance of 'azoun village, east of Qalqilya, and at the eastern entrance of Qalqilya. At approximately 03:00 on Tuesday, 15 September 2015, Israeli forces established a checkpoint between Jayous and Kafor Jamal villages, northeast of Qalqilya. Tulkarm: At approximately 20:00 on Thursday, 10 September 2015, Israeli forces established a checkpoint at the entrance of Shoufa village, southeast of Tulkarim. At approximately 21:30 on Monday, 14 September 2015, Israeli forces established a checkpoint on the main road between Tulkarm and other villages located in the north of Tulkram, which called (al-Sha'rawiya), near the intersection of 'alar and 'Ateel villages, north Tulkram. At approximately 21:00 on Tuesday, 15 September 2015, Israeli forces stationed at 'nab military checkpoint on the main road between Tulkram and Nablus, stressed their arbitrary measures against Palestinian civilians and restricted their movement. Jenin: On Monday, 14 September 2015, Israeli forces stationed at al-Jalama checkpoint separating between Jenin and Israel, northeast of Jenin, closed the checkpoint against the Palestinian civilians movement , who have a permit allowing them to travel into Israel on the occasion of Jewish holidays. Note: all the aforementioned checkpoints were later removed, after the inspection of the vehicle and its passengers and detained them for varying periods, and no arrests were reported. · At approximately 05:45 on Sunday, 13 September 2015, when worshipers finished performing the dawn (Fajr) prayer in al-Aqsa Mosque and started getting out of the mosque, large numbers of special Israeli forces stormed al-Aqsa Mosque firing sound bombs and rubber-coated metal bullets. Israeli forces immediately closed the Qibli (southern) mosque while dozens of Israeli soldiers topped the roof of the mosque. They surrounded the young men staying inside and sprayed pepper spray over them. Officers from the special forces evacuated all al-Aqsa Mosque's yards. In the morning, Israeli forces smashed the windows of al-Qibli Mosque and fired sound bombs and tear gas canisters at young men trapped inside, due to which the carpets caught fire. Moreover, Lo'ai Abu al-Sa'ed, one of the mosque's guards, sustained a bullet wound to the chest; Jad al-Ghoul, a civil defense officer in al-Aqsa Mosque, sustained a bullet wound to the left arm; Anas Siyam (14) sustained a bullet wound to the chest; and Lewa Abu Ermaila, a journalist at Palestine Today satellite channel, and Sabreen Ebeidat, a photojournalist at Quds news network, both were injured by shrapnel from a sound bomb. An eyewitness stated that Israeli forces attacked and pushed Arab members of the Israeli Knesset, who could entered al-Aqsa Mosque, namely Ahmed al-Tibi, Osama al-Sa'di and Talab Abu 'Arar. This attack coincided with banning students of al-Aqsa Shari'a schools located inside the mosque (Riyadh al-Aqsa, al-Aqsa School for Boys and al-Aqsa School for Girls), who are about 500 female and male students, from entering the mosque and joining their schools. In addition, Israeli forces denied the administrative and educational employees entry by attacking and pushing them while being present by Hetta and al-Selsela gates. Israeli forces had also prevented worshipers below 45 years old from entering the mosque since the predawn. Afterwards, groups of Israeli settlers led by the Minister of Agriculture, Uri Ariel, stormed the mosque through al-Maghareba gate. They performed biblical rituals in al-Hersh area near al-Rahma gate under the protection of Israeli forces. In the meantime, Israeli forces deployed in the mosque yards attacked all who were present there and pushed them away from the yard of al-Qibli and Marwani mosques. Moreover, they attacked Omer al-Keswani, director of al-Aqsa Mosque, and employees of the Islamic endowment (Waqf) and took them out through al-Majles and al-Selsela gates. Dozens of worshipers gathered at al-Selsela gate after they were denied access to the mosque. They clashed with the Israeli forces that used clubs and sticks and fired sound bombs, tear gas canisters and rubber-coated metal bullets. As a result, over 110 persons suffered various wounds. The majority of them received medical treatment on the spot and the others were taken to nearby medical centres. Besides, 20 persons were transported to al-Maqased Hospital in al-Tour neighbourhood. In addition to the 2 abovementioned journalists, 9 other journalists sustained bruises as they were directly attacked by Israeli forces. The attacked journalists were identified as follows: Ahmed Gharabla, a photojournalist of the French News Agency; Dyala Jweihan, a reporter of al-Hayat Newspaper; Jihad al-Mohtaseb, a photojournalist of Ro'ya Sattelite Channel; Monther al-Khateeb, a photojournalist of al-Ghad al-Arabi News Channel; Diaa' Hoshiye, a reporter of al-Ghad al-Arabi News Channel; Ethat Abu Ghariba, a freelance photojournalist; Mahfouz Abu Turk, a freelance photojournalist; Ali Yaseen, a photojournalist of Palestine Satellite Channel; and Mo'men Shabana, a photojournalist of Ma'an Satellite Channel. · At approximately 07:30 on Monday, 14 September 2015, Israeli forces moved into al-Aqsa Mosque and attacked the Palestinians, who were present in the yards, with sound bombs and rubber-coated metal bullets. 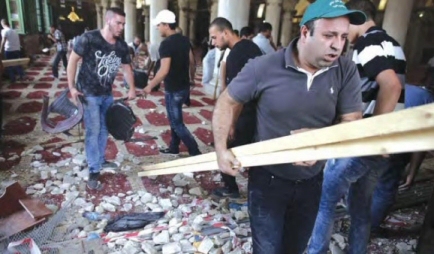 Minutes afterwards, they raided al-Qibli Mosque, where Palestinian young men and worshipers were. They fired bullets and sound bomb, due to which 68-year-old Ghaleb Hussein Douri sustained a bullet wound to the eye and was taken to Tsha'ri Tseideq Hospital for medical treatment. Moreover, 6 young men suffered tear gas inhalation as they were trapped inside the Qibli Mosque and were sprayed with pepper spray. Surrounding the mosque by Israeli forces continued from approximately 06:30 until 11:00, which was the period when settlers stormed the mosque. It should be noted that 38 settlers stormed al-Aqsa Mosque via al-Maghareba gate in the Jewish New Year. It is worth saying that Israeli special forces closed the doors of al-Qibli Mosque with iron bars and chains and sprayed pepper spray over Palestinian men, who were inside. In addition, they beat those who were present in the yards. Israeli forces closed most of al-Aqsa Mosque gates for the second day and erected police checkpoints at the open ones (Hetta and al-Selsela gates). They also imposed restrictions on the entry of Palestinian worshipers and denied those less than 45 years old entry. Furthermore, they launched an arrest campaign in the vicinity of the mosque, due to which 11 Palestinians were arrested and taken to al-Maghareba detention facility. The majority of these civilians were harshly beaten. The arrested civilians were identified as: Mostafa Nasser al-Kharouf (24), a photojournalist, Nasser Ahmed Nofal (23), Ramzi Zuhair al-Jo'ba (19), Mazen Halawa (21), Malek Ghanem, Ibrahim Abu Ermaila, Omer Wazwaz, Tamer Khalaf, Mohammed Abu Farha( 24) and Mahmoud Saleem. Moreover, Israeli forces arrested Madeleine Essa (36) and took her to al-Masqoubiya detention facility. · On Tuesday morning, 15 September 2015, Israeli forces raided al-Aqsa Mosque for the third day. They attacked the Palestinian worshipers with sound bombs and stones to secure the settlers' raids on the Mosque in the new Hebrewyear. An eyewitness said that Israeli forces raided al-Qibli Mosque. They arrested two Palestinian civilians, including a child: Mo'men Ahmed al-Taweel (16), Isma'il al-Taweel (20) and Ahmed al-Razem,a paramedic. Israeli forces heavily fired sound bombs and rubber-coated metal bullets. As a result, Fida' Rowaida sustained shrapnel wound to her leg by a sound bomb. · At approximately 19:00 on Friday, 11 September 2015, dozens of settler guards and officers of special Israeli forces moved into Batn al-Hawa area in Silwan village, south of the old city in East Jerusalem, to support a big group of settlers clashing with residents of the area, as those settlers attacked a number of Palestinian children for no reason. An eyewitness said to a PCHR fieldworker that a settler harshly beat Zaid Abu Quaider (8) in Batn al-Hawa for no reason. This coincided with the presence of a Palestinian young man in the place, who intervened to protect the child. The eyewitness added that the young man and the settler quarrelled, during which, about 20 settlers sprayed pepper spray over a group of children aged 5-14 years old. He said that the settlers had gone out of Jamal Sarhan building that was lately seized by the settlers. The eyewitness said that the residents of the area gathered to treat the children, but Israeli forces and settler guards moved into the place and fired sound bombs and tear gas canisters to disperse them and protect the settlers. As a result, Abdullah Abu Nab (60) and Mahdi al-Rajabi (14) sustained serious burns and suffered pepper inhalation, due to which they were taken to al-Maqased Hospital for medical treatment. Moreover, nine children and 3 women suffered tear gas inhalation. · On Monday, 14 September 2015, Israeli forces seized a PRCS ambulance in East Jerusalem. The ambulance was carrying a Palestinian who was wounded by Israeli bullets in al-Eisawiya village. Israeli officers obliged the ambulance at gunpoint to head to Hadasa Hospital and then arrested the wounded person. According to a PRCS statement, Israeli officers stopped an ambulance and threatened its crew. They got into the ambulance and sat near the wounded person, Morad Sarandah (26). Afterwards, they obliged the ambulance to head to Hadasa Hospital. It should be noted that Sarandah was wounded during clashes between Israeli forces and Palestinians in the said village. · On Monday, 14 September 2015, Israeli forces arrested Mo'nes Emad Edkeidek, who was present in front of his family's house in Ras al-Amoud neighbourhood, although he was wounded. The child's father said to a PCHR fieldworker that his son Mo'nes was arrested when he was present in front of his family's house in Ras al-Amoud neighbourhood. Israeli forces fired 3 rubber-coated metal bullet towards him. His son was wounded and was in pain on the ground, yet about 8 Israeli soldiers attacked and harshly beat him under the pretext of throwing stones. The father added that Israeli forces arrested his son, during which the family and Israeli forces quarrelled. Israeli forces refused to offer him any information about his son's health condition. · In the afternoon, Sali Yusef Moheisen (13) sustained a bullet wound to the neck when clashes erupted between Israeli forces and Palestinian youngsters at the entrance of al-Eisawiya village, north of East Jerusalem. Mohammed Abu al-Hommos, member of the follow-up committee of al-Eisawiya village, Sali Moheisen sustained a bullet wound to her neck when she was with her family in al-Salam Park near the entrance of the village. He added that Israeli forces called an ambulance to transport her. Abu al-Hommos said that Israeli forces moved into the village through its main entrance and were deployed everywhere. They sprayed waste water at the houses, vehicles and everything around. They also fired rubber-coated metal bullets, sound bombs and tear gas canisters. · On Tuesday, 15 September 2015, Israeli forces opened fire at Hamza Mahmoud Hoshiya (17) from Shu'fat refugee camp, north of occupied Jerusalem, when they were chasing him in al-Eisawiya village, northeast of the city. As a result, he was wounded in the head and leg. Tha'er Fasfous, spokesperson of Fatah movement in Shu'fat refugee camp, said that Israeli forces chased a car driven by Hoshiya's friend in al-Eisawiya village and opened fired at it. As a result, Hamza sustained two bullet wounds to the head and leg and he and his friend were arrested. Fasfous added that Israeli forces summoned Hoshiya's mother to question her. Israeli forces took Hoshiya to receive medical treatment in the hospital without informing his family about his health condition. · At approximately 01:00 on Thursday, 10 September 2015, Israeli forces moved into al-Tour neighbourhood, east of East Jerusalem. They raided and searched a number of houses from which they arrested 3 young men:Mohammed Yasser Abu al-Hawa (21), Shadi Ahmed Khweis (19) and Majdi Amed al-Sayyad (21). · At approximately 02:00 on the same day, Israeli forces raided and searched a house belonging to Ayman Salem Eweisat in Jabal al-Mukaber village, southeast of East Jerusalem. They arrested his son Ali (20) and took him to an unknown destination. · At approximately 07:30, Israeli forces arrested Khalil Ra'ed Abu Tayeh (17) while heading to the school via al-Nather gate of al-Aqsa Mosqueiin the old city in Jerusalem. They took him to a detention facility in the city. · At approximately 10:00, Israeli forces arrested Mahmoud Nader Edris (20) after harshly beating him, as he tried to enter al-Aqsa Mosque in coincidence with the raid of 30 settlers on the mosque. Israeli forces took the aforementioned person to al-Masqoubiya detention facility. · On Sunday, 13 September 2015, dozens of youngsters gathered around al-Louza valley neighbourhood in Silwan village, south of the old city in Jerusalem, in protest at raids on al-Aqsa Mosque. Israeli forces fired sound bombs and tear gas canisters and chased them between the houses. They also arrested Mahmoud Abu Nab (17) in the same neighbourhood. · In the morning too, Israeli forces arrested 2 Palestinian women and 3 young menafter al-Aqsa Mosque was closed and stormed by the Israeli Minister of Agriculture, Uri Ariel, along with other settlers. The arrested persons were identified as Alaa al-Daya (24), Elham al-Jo'ba (26), Mousa al-Ajlouni (24), Yehya al-Soutari (32) and Hazem al-Salehi (34). · On the same day afternoon, dozens of boys gathered at the southern and main entrance of al-Eisawiya village, northeast of occupied Jerusalem, in protest at raids on al-Aqsa Mosque. Israeli forces fired sound bombs and tear gas canisters at them and arrested Adam Moheisen (17). · At approximately 21:00 on Sunday, 13 September 2015, Israeli forces moved into Ras al-Amoud neighbourhood, east of the old city in East Jerusalem, after a group of Palestinian youngsters threw fireworks and Molotov cocktails at "Ras al-Amoud" settlement. Israeli forces fired tear gas canisters in response to disperse them and then fired rubber-coated metal bullets. Clashes continued until late night. Israeli forces withdrew later and neither casualties nor material damage were reported. · On Monday, 14 September 2015, Israeli forces moved into Helwa valley neighbourhood in Silwan village, south of the old city in East Jerusalem. They closed one of its entrances in coincidence with the arrival of dozens of settlers at the village to perform Talmudic rituals in the new Hebrew year. An eyewitness said to a PCHR fieldworker that Israeli forces were deployed in the main street when settler came to Ein Silwan in the village to perform their rituals. He added that the settlers where in large groups and intended to dance and sing to provoke the Palestinian civilians. Israeli forces attempted to arrest a child under the pretext of throwing a Molotov cocktail at a settler. The eyewitness said also that Israeli forces moved into the neighbourhoods of the village and tried to top the roof of a building overlooking the village, but young men confronted them. As a result, Israeli forces arrested Nour Samrin (16) and took him to an unknown destination. · On Tuesday, 15 September 2015, Israeli forces moved into Qa' al-Hara area in al-Tour village, east of the old city in East Jerusalem. They arrested Mo'ath Ahmed al-Sayyad (12), who was in a grocery. They also seized the ID card of Ahmed Jasser Abu al-Haea (19) and refused to give it back. They withdrew later transporting the child to an unknown destination. · At approximately 16:00 on Wednesday, 16 September 2015, Israeli forces arrested 3 Palestinian children who were present in al-Amoud gate area in the old city in East Jerusalem. They took them to Saladin police station to be questioned. The arrested persons were identified as: Mohammed Isma'il Ahmed Hoshiya (11), Mohammed Adel Abdul Hadi Sweiti (11) and Yazan Ahmed al-Banna (12). Israel has continued its settlement activities in the oPt, a direct violation of international humanitarian law, and Israeli settlers have continued to attack Palestinian civilians and property. · At approximately 09:00 on Wednesday, 16 September 2015, Israeli forces backed by military vehicles and a Civil Administration vehicle moved into Kherbet Khellet al-Mayeh, east of Yatta, south of Hebron. They handed Mohammed Ezzat Makhamra al-Adra a notice to halt construction works in his 2-storey house (200 square meters) under the pretext of non-licensing. · At approximately 10:30, Israeli forces backed by military vehicles and a Civil Administration vehicle moved into Kherbet Erfa'iya, southeast of Yatta, south of Hebron. They handed Mohammed Ra'ed Mahmoud al-Emour a notice to halt construction works in his 70-square-meter house under the pretext of non-licensing too. · At approximately 19:30 on Sunday, 13 September 2015, a number of settlers in a vehicle with an Israeli registration plate coming from the western part of Hawwara village, south of Nablus, attempted to kidnap Fadi Wesam Abdul Rahim Dmeidi (7), who was walking on the street and heading to a supermarket. The boy stepped out of his father's car, 40 meters away from the supermarket when the abovementioned vehicle passed by. A settler tried to pull the boy into the car from his back, but the boy screamed and fell down over his back and head. His father panicked and hurried up to him. He put his boy in the car and chased the settlers' car eastwards but he could not catch them. The father then took his son to Rafidiya Hospital in Nablus. It was found that he sustained bruises in the back and neck.